Can I see the transit? 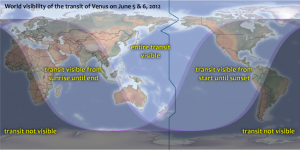 For a first glance look, check this map to see if you are suitably located to observe the 2012 transit. The 2012 transit will be visible in its entirety only from the western Pacific, eastern Asia, eastern Australia and high northern latitudes. For much of Europe the Sun will rise on 6 June with the transit almost finished; for the US, the transit will begin in the afternoon of 5 June. There’s also a handy tool at http://transitofvenus.nl/wp/where-when/local-transit-times/ that allows you to set your precise location to find out how much of the eclipse you will be able to see, along with the predicted path that Venus will trace across the Sun from your location.